Service providers are increasingly becoming involved in the deployment of Web Real-Time Communication (WebRTC) technology to deliver richer forms of unified communication services to more connected users. Even though WebRTC opens up many great opportunities to extend existing VoLTE, ViLTE, VoWiFi and RCS services while also creating entirely new services to their customers, service providers need to be careful what they wish for. One of the biggest challenge is preparing networks to address interworking of new and extended services in a well-defined standardized approach. 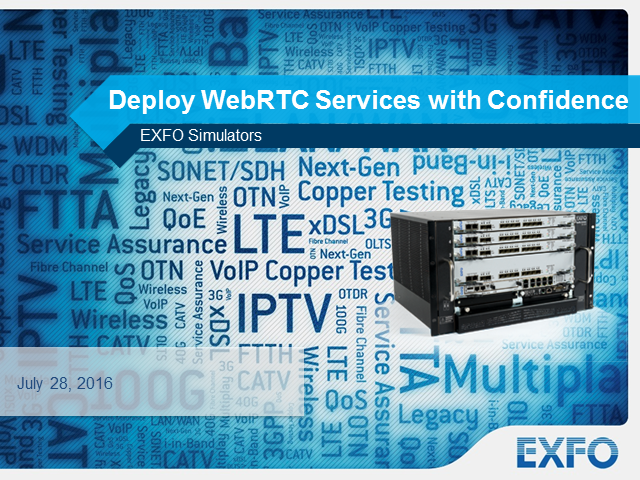 This webinar explores how service providers can maximize their goals by deploying standardized WebRTC services with confidence. Insight is provided on architectural requirements surrounding WebRTC implementation–including networks, devices (WebRTC gateway/SBC) and protocols–to deliver uncompromising network and service performance in today’s highly-competitive environment. Network architects, designers, lab managers and testers from service providers, large enterprises, and manufacturers, press, and analysts looking to understand how to design, build, test and deploy WebRTC services. The transition to network functions virtualization (NFV) is top of mind for the wireless industry. Reduced CAPEX & OPEX as well as greater flexibility and speed are among the many promises. However, it has become clear that the journey is going to be anything but smooth. Still-evolving standards, inter-operability challenges, stability and performance are only some of the many concerns. And for good reason. In this fluid, rapidly changing environment, testing becomes of paramount importance. The scope of testing, however, must go beyond just traditional network functions testing. Test methodologies must become NFV-centric and incorporate testing of NFV’s specific aspects, such as elasticity, service chaining and VNF lifecycle management, among others. Test solutions must integrate seamlessly into the NFV framework—with particular emphasis on automation. Join us for a webinar to learn more about the testing challenges with NFV and EXFO’s approach to addressing them. On the road to 5G, centralized radio access network (C-RAN) architecture is a key stepping stone. C-RAN is the next logical evolution in fiber-to-the-antenna (FTTA) networks, or distributed RAN (D-RAN), and involves centralizing several baseband units (BBUs) in a location away from the towers and antennas, rather than collocating BBUs with the remote radio head (RRH) on the antenna site. In this whiteboard video, we will explore 2 specific challenges of C-RAN networks, namely the attenuation issues induced by the long distance between the BBU and the RRH, and the interconnection problems – and finally how to solve them. This webinar will conclude with a live Q&A session! Virtualization brings with it so many promises, changes and so much uncertainty. Will smarter networks actually deliver? Network transformation is imperative if you’re planning to be part of the massive digital transformation sweeping the industry. However, your transformations can’t negatively impact customers, despite the new level of complexity brought on by the virtualization and abstraction technologies required to meet the explosive demand for new, tailored services. Your extensive network functions virtualization (NFV) and software-defined networking (SDN) investments must improve your bottom line, competitiveness and service quality. But how can you be sure that such investments will actually deliver on all the promises and improve the quality of experience for your subscribers? Join us for this webinar and we’ll help you find the answers to these questions. - Those involved in the rollout of telecommunications networks, with a focus on network and service assurance platforms. - This includes network operations, software platforms and back-office systems. The ratification of the 3GPP R13 specifications last year was like the firing of a starting pistol, kicking off the race to deploy NB-IoT networks. NEMs are racing against the clock to support the many changes mandated by these specifications. For their part, MNOs are announcing aggressive schedules to launch their NB-IoT networks and time to market pressures are intense. However, quality and reliability cannot be compromised. Ensuring a successful launch under these conditions requires rigorous and comprehensive testing in a time & cost-effective manner. Not only do compliance, functionality and inter-working need to be verified, but also the ability to handle the load and traffic patterns that can be expected in a live network with several million IoT devices. This webinar will delve deeply into what it takes to test IoT network elements and networks in order to get them ready for launch. Whether you are interested in conducting end-to-end testing of the network or isolating certain specific elements for testing, such as the eNodeB, MME, SGW or SCEF, for example, you will gain new insights based on our extensive 3GPP technology testing experience. We are in a world where real-time data and intelligence are critical for dealing with network performance issues that can lead to catastrophic failures in your optical fiber network. Proactive network monitoring and rapid response capabilities allow communications service providers (CSPs) to reduce MTTR and maintain SLAs. Participate in our webinar to learn how EXFO and Ubisense joined forces to integrate optical fiber testing and monitoring with geomobility technology that connects GIS design and asset data with real-time status information, transforming next-generation network management and operations. The surge in web-based, bandwidth-intensive applications has created new opportunities to deliver increasingly advanced services at higher speeds, alongside cutting-edge technologies. With its unmatched scalability and cost-effectiveness, Ethernet/IP has become the underlying technology of data communications and should be well understood by all players in the telecommunications industry. This 2-part webinar series addresses the fundamentals of testing Ethernet technology, as well as the tools and standards required in effectively turning up and troubleshooting next-generation Ethernet services. -What is unique about 100G testing? Get the insights you need to achieve faster Ethernet service turn-up with first-time-right results! Webinar #1: February 9, 2017. + Bit Error Rate measurements – Are they good enough? This webinar is the second of a series for network equipment manufacturers (NEMs) tackles the challenges faced by them in delivering innovative solutions in the context of a rapidly changing environment with pressures and constraints faced in the lab/R&D and in manufacturing. Keeping up the rapid pace of innovation is an ever present challenge for network equipment manufacturers. There has been a reshaping of the vendor equipment industry from box development to solution-oriented innovation and deployment. Lab and R&D centers have become expertise hubs, yet they need to derive more value from their R&D spend, particularly when it comes to equipment. This webinar is the first of a series for network equipment manufacturers (NEMs) tackles the challenges faced by them in delivering innovative solutions in the context of a rapidly changing environment with pressures and constraints faced in the lab/R&D and in manufacturing. 5G continues to generate buzz and grab the attention of many. It will be the platform enabling growth in many industries, ranging from the IT sector to the automotive, entertainment, agriculture and manufacturing industries. Different sectors have different use cases and network requirements. Some require superfast downloads while others require ultra-reliable communication. 5G networks will have to cater to an extremely wide variation in requirements. While the official 5G specifications are set to be published in mid-2018, there are already announcements by major network operators about its launch starting as early as next year. The anxiety around 5G, the race to be the first, and the unavailability of global standards could bring about a few challenges at the beginning. You need to ensure that the analysis is performed in real time. Most service assurance solutions set real-time analytics as a goal. Being such a key component of the service assurance solution, further analysis is required on how close to that goal the solution can reach. There are many areas in this type of solution that demand attention: data collection, normalization, correlation, analysis, service-level impact, alerting and more. Each element requires a specific set of strategies to optimize the time taken to make a determination. Key questions you need to ask when defining real-time analytics include: How many moving pieces do we have on the service assurance solution? How many different vendors are involved? How many data collection systems? Do you need to transfer that data to a second service quality or service experience analytics solution before deciding you need to request a change from the orchestrator? How does your system scale? How many times do I need to manipulate the data to integrate it across multiple systems? Do you need to aggregate collected data at multiple levels before a decision is made? This webinar gives an overview of the OTN multiplexing signal structures and their benefits. It explores an efficient way to validate all optical demultiplexer unit (ODU) channels simultaneously. There has been a lot of pressure and discussion around the increasing use of optical transport networks (OTN) within the carrier’s environment; this is due to the increased demand for higher bandwidth where OTN offers efficient traffic grooming and optimal granularity. OTN’s flexibility makes it the main client transport mechanism today, especially up to 100G. This webinar gives an overview of the OTN multiplexing signal structures and their benefits. It explores an efficient way to validate all optical demultiplexer unit (ODU) channels, using a new high-granularity OTN multichannel application capable of monitoring all sub channels simultaneously up to OTU4. - A new capability that allows optimal detection and monitoring of multiple OTN channels, removing the need to characterize each individual channel and reducing testing time. Network and service assurance remain a top priority for telecom operators, though views on what those assurance levels need to be in a virtualized environment remain in flux. This webinar will look at some of the challenges telecom operators and vendors are facing in terms of updating their assurance platforms in virtualized environments; how the view on what is needed in terms of assurance is changing due to virtualization; and provide an update on the development of assurance strategies from carriers and vendors. Learn how managing resources in the field can simplify and streamline the complete test and compliance validation process. Nearly 90% of test results contain data entry errors. On average, 50% of technicians’ time is spent on bookkeeping. Rising bandwidth requirements, a surge in data usage and increased network complexity is putting more pressure on mobile network operators (MNOs) to modernize and upgrade their networks quickly and more efficiently. Conversely, they need to control their CAPEX/OPEX in order to protect their margins in an extremely competitive market. This means adopting a smarter approach to managing resources in the field when building fiber-based architecture such as fiber-to-the-antenna (FTTA) and centralized radio access networks (C-RAN). To date, the buzz about the Internet of Things (IoT) has been more talk than walk. Promises—or warnings, depending on one’s point of view—of up to 30 billion devices by 2020 have been floating around for a while, yet hardly any progress has been made towards it. From the perspective of mobile network operators (MNOs) and network equipment manufacturers (NEMs), the main roadblock had been the lack of IoT standards from 3GPP. While 3GPP has taken baby steps to address the IoT since Release 10 (R10) in 2011, there hasn’t been a comprehensive set of specifications—until now! The move from centralized to virtual radio access networks (RANs) is already happening, with baseband unit (BBU) virtualization moving many functions to software, paving the way for 5G and pre-5G LTE-Advanced (LTE-A). This webinar explores the market drivers and the technical challenges of the RAN transformation from fiber to the antenna (FTTA) to centralized RAN (C-RAN) and virtual RAN, the state of virtualized baseband unit (vBBU), the long-term evolution of fronthaul beyond the Common Public Radio Interface (CPRI) to packet-based transport, and testing requirements at the optical and protocol layers. Be ahead of the game and learn how to reduce repeat site visits, enable faster service deployment and accelerate time-to-revenue in metro networks, data center interconnect (DCI) and business services. In a highly competitive market, service providers need to turn up next generation Ethernet services more quickly to get to revenue faster, but without impacting the quality of service (QoS) and quality of experience (QoE) of their end customers. Additionally, field technicians need to rapidly gain proficiency in a multitude of technologies to keep pace with a host of new testing requirements. Get the insights you need to achieve greater testing efficiencies! Take advantage of this free webinar! This webinar series covers everything you need to know to efficiently qualify fiber-to-the-antenna (FTTA) networks and confirm that remote radio heads (RRH) and CPRI links are fully functional before leaving the cell site – in just one field trip. CPRI basics and common issues faced in the field. What is the importance of CPRI link validation before turn-up? What are the best industry practices to validate RRH installation? Come learn about all aspects of test, measurement and quality of service on telecommunications networks.